The Fellowship was fortunate enough to obtain a copy of EMPOWERED: ANIMAL STYLE from Dark Horse Comics. Adam Warren writes, and John Staton and Adam Warren draw. Empowered has landed herself an easy gig guarding vehicles at a superhero tech show. Unfortunately, a group of bad guys pick her shift to waltz in and start robbing the place. She’s outnumbered, but she solves that problem with some nifty guerrilla tactics. But once they find her, things get interesting. Simply put, this book is a stone-cold hoot. More technically, Warren’s use of “meta” to ramp up the comedy is brilliant. EMP is both witty and resourceful, putting her teenage attitude and her super-powered education to good use. And the rented animals are inept and unlikeable enough to make her thrashing of them even more fun. And the art is very nicely done; there’s lots of genre-appropriate destruction and mayhem packed onto these pages. This is a well written, well drawn, wonderfully fun super-powered romp. I recommend it highly. I think it would make a good intro to the genre, though parents of teenagers might think otherwise – language is a little salty, and teenage “personality” is abundant. 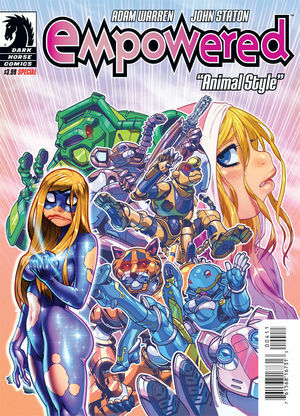 EMPOWERED: ANIMAL STYLE is available now at your LCS or online at darkhorse.com.